This manuscript contains a compilation of fragments of books for royal coronations, ordinations of priests and monks, and other ceremonies which must be conducted by an archbishop or a bishop. Most of the material in it comes from the late Anglo-Saxon period, some of it is later, mostly of the 12th century, and parts are from the Continent. Robert Cotton, who owned it in the 17th century, bound the fragmentary books together in to one, within a cover bearing his coat of arms. 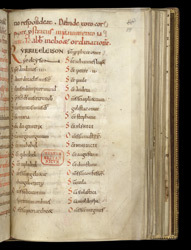 Two fragments of an 11th-century pontifical (instructions for sacraments to be performed by a bishop) from Christ Church, Canterbury, are bound into the book. This page presents directions and prayers for the ordination of a monk. At this point, the monk is to throw himself onto the floor in supplication (written in red) while the abbot leads the congregation in the Kyrie (a prayer of supplication in Greek) followed by a litany (prayer of supplication to God and the saints). Among the saints of the litany, the names of St Alphege (the martyred archbishop of Canterbury) and St Benedict, who were especially revered by monks of Anglo-Saxon England, appear in capital letters. The script (style of handwriting) is that of Christ Church but not in a grand manner, suggesting that it was made for a bishop rather than the archbishop.